Once the chicken has marinated, heat up a frying pan with a tbsp of olive oil and add the chicken breasts skin side down and allow to cook for 4-6 mins to get a good golden colour. Turn the chicken over and do the same on the other side. Now place the pan in the oven and cook for a further 8-10 mins until the chicken breast is fully cooked but not over cooked. In a sauté pan add the olive oil, shallots and garlic and gently fry until the shallots are translucent and just turning golden brown. Add the chickpeas to the pan and a little of the liquid from the tin, cook until the chickpeas have absorbed the liquid and are nicely coated in the spices and onion mix. In a large serving dish or individual bowls place the chickpeas, cooked potatoes and scatter the aubergine pieces. 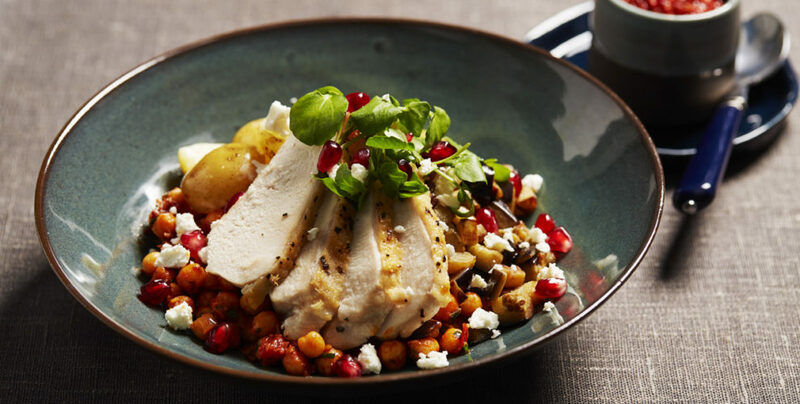 Finely slice the chicken breast and arrange on top of the chickpeas. 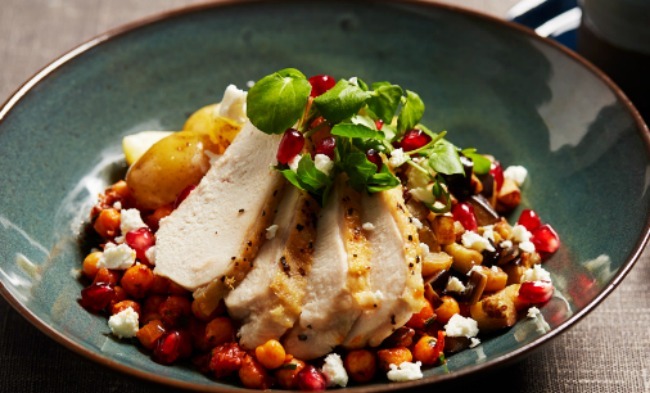 Top with the crumbled feta and pomegranate seeds and finally add the watercress leaves.